Lisa Properjohn, registered nurse specialising in paediatrics at Pharmacy 777 Whitford City, WA, says pharmacy is in an ideal position to support mums in caring for their baby through practical advice and reassurance. “When you travel by airplane you’re told to put the oxygen on yourself first before helping your children; I often give lactating mums this analogy. “It’s not a selfish act for mothers to look after themselves; they need to do so in order to give optimal care and nutrition to their child. It can be helpful for pharmacy staff to remind them of this and also reassure them that they’re doing a good job,” says Properjohn. Jodie Warburton, midwife and sleep consultant, says it’s common for women, especially first time mums, to underestimate the change to their lives that a new baby brings. “During pregnancy, the main focus tends to be primarily on the labour and birth. There isn’t as much information and preparation provided in classes for once parents get home with their newborn baby. The lack of sleep however is something I don’t think anyone can really prepare for and it can come as quite a shock. Fresh air—encourage new mums to get outside every day. Go for a walk or just sit in the garden. What you do doesn’t matter as much as the fresh air and sunshine. Bond with baby—tell mums not to worry about strict routines in the first three months, but just to focus on feeding and helping the baby get the sleep they need. Help and rest—check that they have adequate support and advise on local services they may find useful. Promote any services your pharmacy offers such as a lactation consultant, sleep consultant, postnatal doulas, maternity nurses, etc. Nutrition—remind mums of the importance of fuelling their body with healthy and nourishing foods and drinking plenty of water as this is vital for milk supply as well as energy levels and recovering from birth. However, pharmacy can play a role in ensuring that lactating women are aware of mastitis, the symptoms and how to prevent it. “The symptoms of mastitis include pain, redness and swelling in thebreast area, fever, muscle pains and aches,” says Dr Fielder. “To help prevent mastitis, breastfeeding women should regularly feed their baby—every three hours and avoid long interval between feeding. Placing a heat pack on the breast immediately before feeding can help with milk flow while a cool pack after feeding can ease discomfort. “Being able to offer the services of a lactation specialist who can make sure the baby is attaching properly and feeding well is invaluable for mums and can help alleviate many of the common issues. Mums come here and they know they will get a solution to their problem,” says Properjohn. “The most important thing is to increase fluid intake because women lose a lot of fluid when breastfeeding. Staying hydrated is really important,” says Melanie McGrice, accredited practising dietitian and spokesperson for the Dietitians Association of Australia. She explains that the macronutrient ratio of breastmilk is 55.6% fat by calories, 38.8% carbohydrate and 5.6% protein. As such, she says pharmacists and their staff can promote the importance of eating a typical healthy diet but with a few extra vegetables and grains. Pharmacists and staff can promote the importance of eating a typical healthy diet but with a few extra vegetables and grains. “The vegetables provide fluid and fill you up without adding too many kilojoules while the grains provide the additional carbohydrates that you need when breastfeeding. While vitamins are commonly discussed during pregnancy they can be overlooked once the baby comes along. Pharmacy staff can remind women of the importance of adequate nutrition postpartum. “Iodine is particularly important throughout breastfeeding. Foods rich in iodine include seaweed, iodised salt (found in bread), seafood and fish. “Iron (recommended daily intake for lactating women is 9mg a day), vitamin D and omega 3 are the other key nutrients recommended throughout breastfeeding. As long as adequate amounts are being consumed through diet, supplementation is not necessary,” says McGrice. continue to limit alcohol and caffeine—especially in the first month after the baby is born. “The most common queries we hear about the baby focus on symptoms of colic, sleeping problems, feeding issues, weight and length, constipation, eczema and teething,” says Properjohn. She says that while some babies are born with teeth and others can start teething as young as three months, it’s more common for babies to cut their first tooth between four and six months. “More often than not when a mum presents with a baby under theage of four months who is irritable, producing a lot of saliva and putting their hands in their mouth—this is part of a developmental phase; it’s not actually teething. “Of course for babies that are teething we have plenty of OTC products and advice we can offer. For example, Brauer has a teething gel and liquid and Weleda offers a teething powder. If the baby is on solids, Tommee Tippee has a Fresh Food Feeder that the baby can bite down on. Mums will often present to the local pharmacy for a solution to their baby’s pain or symptoms of reflux. Properjohn advises it’s vital to engage in conversation and to rule out other more serious causes. “A baby’s cry communicates everything, so we need to identify whether pain really is the source of the cries and then what’s causing the pain. Is the pain due to reflux? Is an overly full stomach causing the pain? “Start with the simple things and drill down to the more serious considerations, always keeping red flags in mind. In the case of reflux we might consider a thickened formula to hold the milk down or perhaps there’s the need for prescription medication. “It’s possible that constipation might be the source of the pain. Again, in the back of your mind you need to consider the potential emergency situations. Is there projectile vomiting? Is the pain particularly intense or causing spasms? 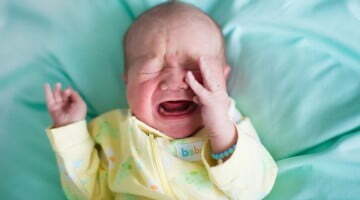 “Constipation is common, often due to the baby being overfed. If the baby is on infant formula, we might ask if they are remembering to level off the scoops, using a different scoop (not the one provided with this particular brand of formula) or perhaps they’re feeding too often. Quite often we identify volume as an issue with bottle-fed babies,” says Properjohn. Being able to offer the services of a lactation specialist who can make sure the baby is attaching properly and feeding well is invaluable for mums and can help alleviate many of the common issues. McGrice adds, “A lot of mums are unsure what a baby’s stools should look like and they can get concerned. Constipation is ‘difficulty and pain on defecation’ and the stools are usually hard and can be described as ‘rabbit droppings’. We define constipation as less than three stools a week. McGrice notes that pre and probiotics in formula are proving beneficial. In fact, emerging research is showing that while breastmilk remains the gold standard, infants fed on formula with added prebiotic oligosaccharides(galacto-oligosaccharides, fructooligosaccharide, polydextrose, and mixtures of these) have a lower stool pH, a better stool consistency and frequency and a higher concentration of bifidobacteria in their intestine compared to infants on a non-supplemented standard formula. Properjohn explains that engaging women at this vital life stage and providing the advice and support they need can result in a customer for life. “We had a lady come into the pharmacy who had just emigrated from Sweden with her husband and newborn baby. She had no idea where to get her baby weighed so I provided this service and then also linked her in with a child health nurse, gave her information on schools and playgroups in the area as well as the details of a local GP that specialises in paediatrics.